Second Pressing with alternate artwork now available! The first pressing sold out almost immediately, so we made some more, with alternate covers, this time with hand painted suns, cacti, and spines by Haboob mastermind, Jeff Grubic! Still on red and blue flame vinyl! Only 100 copies! Haboob are a freaky weird Instrumental Jazz/Prog/Funk/Psych band and can be loosely described as a Golden Boots side project, as many of the main players are also in Golden Boots. 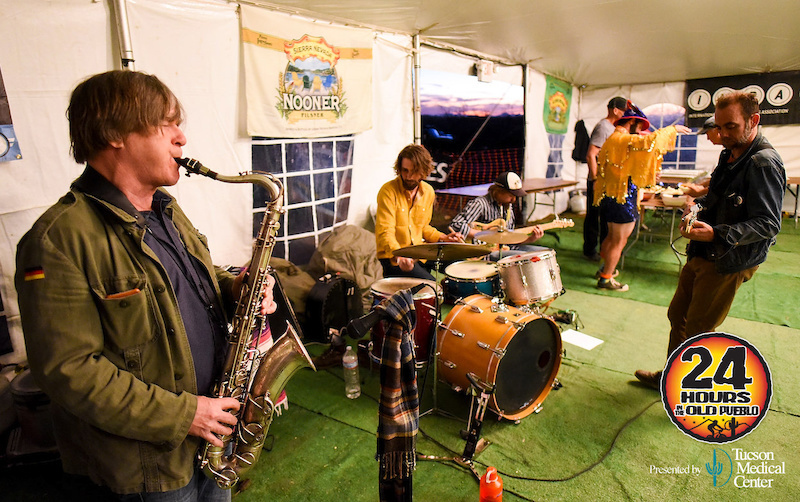 Led by Jeff Grubic (who frequently plays sax and keys with Golden Boots), Haboob is usually made up of 3 or 4 of the following dudes, who are all Golden Boots: Ryen Eggleston, Andrew Collberg, Ben Schndeider, and Dimitri Manos. Along with organist Nick Letson (who is my roommate and also played on the upcoming Golden Boots LP). Haboob constantly plays shows around Tucson for audiences as varied as wealthy dinner crowds, senior citizens, and noise shows. First pressing Ltd ed of 100 copies in red covers on Red VInyl with Blue Flame splatter sold out! !